Aeration is commonly combined with spring or fall cleanup. It improves the oxygen level and compaction of the soil system. The soil plugs pulled out of the turf will remain on the lawn and will break down in the weeks after. If requested we can rake them up and dispose at an additional charge. 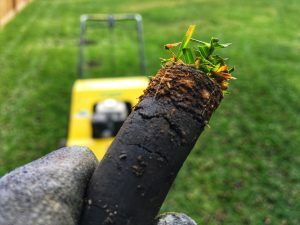 Aeration is most beneficial with a moist soil. If it’s too dry, the soil is too hard for the machine to penetrate the ground. You will also need to have your sprinkler heads flagged prior to this service as they may get damaged when hit. Our machine has golf course equipment technology! Reciprocating tines provide vertical coring action, punching straight in and out without tearing up the turf, offering hole quality on par with golf course requirements (results may vary under certain conditions).